Committing to mechanical insulation for your facility can be a big investment, and it can be challenging to figure out whether the investment will provide a worthwhile return. Today I want to present some projections for real U.S. companies that show a clear return on investment. A few years ago, the U.S. DOE’s Industrial Technologies Program did over 700 assessments of real U.S. companies to determine the total potential energy savings and emission reduction with the addition or maintenance of mechanical insulation. By improving and replacing missing insulation on steam and condensate lines at 2 steam plants, Bayer has a potential savings of $926,000 per year. By replacing missing pipe insulation, Boise Cascade Paper Mill has an estimated savings of $80,000 per year. The cost to complete the work? $25,000, giving them an ROI of 3.2 months. By replacing, repairing, and improving insulation on their steam system, Dow Chemical has a potential savings of $811,000 per year. By filling in their partially insulated systems, Goodyear has a potential savings of $402,000 per year. The estimated cost to insulate ranges between $80,000 and $200,000, meaning that payback is between 2-5 months. By insulating their 50,000 square feet of hot water washing tanks with a surface temperature of 140 degrees F, Mittal Steel has a potential annual savings of $371,000+ per year. By adding insulation to their bare pipes and fittings at an estimated cost of $150,000, Frito-Lay has a potential annual savings of $80,000 with a simple payback of 1.88 years. 82% of the companies that were assessed would see a simple return of less than 1 year, while 15% would see a medium term return at less than 3 years. Savings like that can’t be ignored. The opportunity for energy and cost savings for companies of all sizes is enormous. 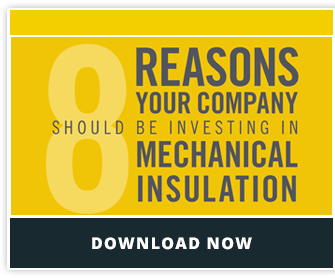 Start planning for your facility’s energy and cost savings today, and learn even more about why your company should be investing in mechanical insulation by downloading our free tip sheet below.